This publication was written to provide information on the current best practice weed management for the central western NSW cropping and pastures region. It contains information that is specific for this area's climate, cropping and weed spectrum. 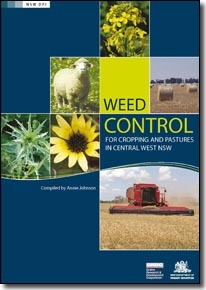 Previously, weed management information focused on the northern or southern Australian cropping areas. The central west cropping and pastures region is mostly defined in this book as the area between the 350 mm and 550 mm annual rainfall zones from West Wyalong in the south to Gilgandra in the north.